A unique school in Manhattan is swapping out textbooks for videogames, in the hopes of renewing children's enthusiasm for learning. Combining gaming with learning is nothing new, as anyone who ever headed down the Oregon Trail knows all too well. But Quest to Learn is taking that concept a bit further by making gaming the centerpiece of its curriculum, as opposed to just a sometimes activity. The school enrolls students from grades 6-12, and the teachers engage their students using a simple concept: learn by doing. With this method in mind, game designers and teachers set out to create a school where students learn school material through videogames and other interactive activities, and solve everyday problems using logic and experimentation. Students rotate through five courses throughout the day: Codeworlds (Math/English), Being, Space and Place (Social Studies/English), The Way Things Work (Math/Science), Sports for the Mind (Game Design), and Wellness (Health/P.E.). These courses are all group-oriented and highly interactive. For example, instead of memorizing random facts about Ancient Greece, students play a game called "Spartan Spy." In this game, students are visited by Pythia, the high Priestess of Apollo, and asked to develop Spartan identities so that they can travel back in time to solve a problem in Ancient Greece. Pythia communicates with the students through riddles, asking them to gather information about the ancient city and devise strategies to solve political, social and economic problems plaguing Ancient Greece. Through this exercise, students learn about the inter-relationships between various elements of a society, as well as how societies impact other societies. I tell ya, that sounds a lot more interesting than my sixth grade presentation on the "Core Philosophies of Spartans in Ancient Greece." Quest also boasts a Facebook-esque social network called Being Me. Being Me allows students to read and critique each other's work, find peer collaborators and post blogs about what they thought of last night's episode of Glee. As if that weren't cool enough, Quest also has "SmallLab," a top down projector with motion sensor machines that allow students to interact with projected images. Anything that keeps students engaged in their classwork would certainly be a boon, but this approach does raise some questions. Even if this new method works, it seems unlikely that many schools will be able to adopt it - especially those in less affluent areas. 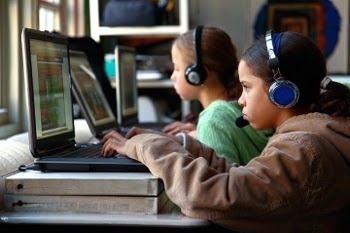 It's also possible that using games as the core educational tool might cause students skills in other areas to suffer. So what do you think: Does Quest seem like the next frontier in education, or a step in the wrong direction?